The formation of stars can be very violent. 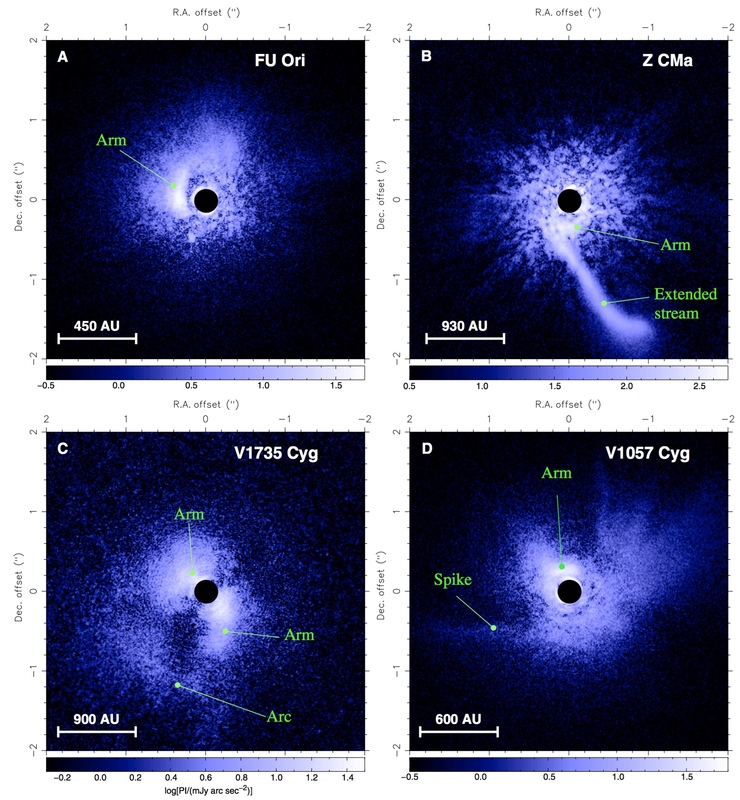 As Figure 1 shows, images of the surrounding circumstellar disks (gas + dust mixtures), which are accreted from their natal cloud, show massive asymmetric features. 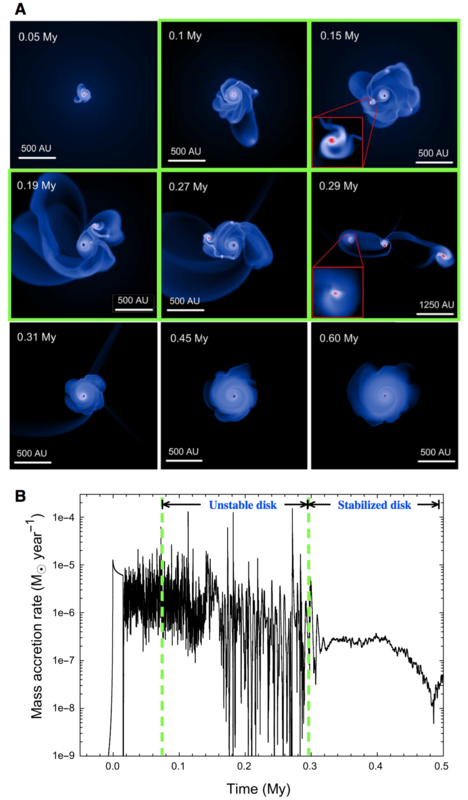 Probably these are clumps, streams and arms of monstrous unstable disks around the young star which drive the accretion of mass and thus the growth rate of it and the build-up and structure of the disk itself. The authors of today’s paper want to match the observations with computer simulations of these events and show that the idea is in quite good agreement with direct images of such objects. The idea goes as follows: when the molecular cloud contracts and forms a star, the gas streams collapse toward the soon-to-be star in a flattened disk. However, as more and more matter is added to the system, the disk itself becomes very massive and therefore gravitationally unstable, eventually forming giant wakes with enhanced densities in local clumps. Figure 2 shows the evolution of such a system in a simulation, starting from a time when the disk becomes unstable. The time periods during which the disk is very unstable and a lot of matter is accreted onto the central object are thought to be reflected in the observation of so-called FU Orionis objects (named after the object in Fig. 1A). These objects show episodic luminosity outbursts, which is probably a sign of very effective accretion during these times. Adding these pieces together gives the following picture: when you form a star from a cloud core, the matter is transported via the disk structure, which “fills up” until it becomes gravitationally unstable, transports most of its mass very quickly onto the star and then becomes quiet again. Then, more matter is accreted from the surrounding, the disk again gains mass, becomes gravitationally unstable… This episodic sequence of events is in general in contrast to the classical picture, in which we would expect a rather steady accretion of gas from the molecular cloud, which gets accreted onto the star until the supply is cut off and the final disk stage (and potentially planet formation) takes place. Overall, the authors achieve an astonishingly good agreement for the four objects they model. This shows that the idea of violent, episodic accretion can potentially hold if the matter inflow is vigorous enough and has profound implications for the formation of young stars. Episodic accretion events are not observed for all disks. So the question remains: is episodic accretion a very general feature of disks or only a growth channel for a specific subset of stars? With the advances in direct imaging of circumstellar disks and further developments in numerical simulations we will hopefully be able to find out!